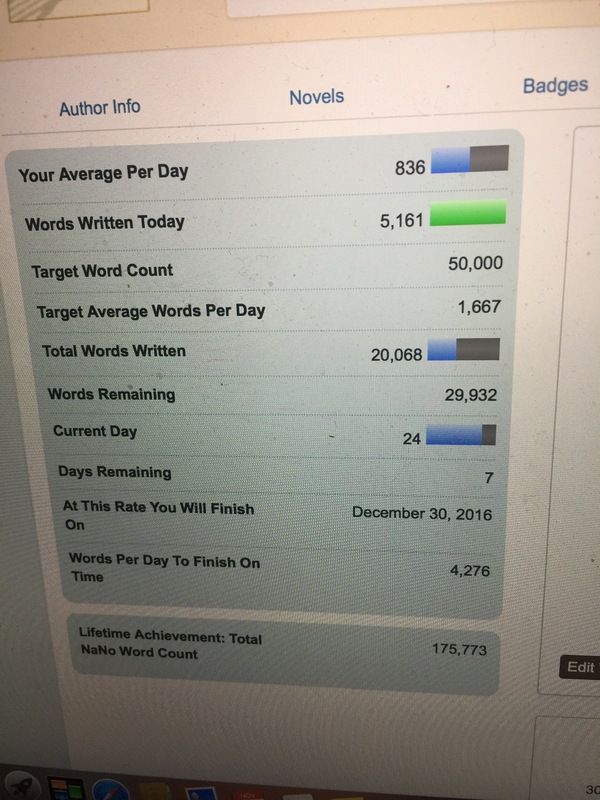 A few days ago, I told you the plight that was my NaNoWriMo project and my overall history with the challenge. I’ve participated several times and finished on time most years but there’s never been a year where I wasn’t scrambling towards the finish line, where I entered the last week without a severe deficit in my word count. Why does the same thing happen to me year after year? Why do I allow the same thing to happen to me every time? Am I not learning? Haven’t I changed? Haven’t I grown? If I had to analyse myself, I would be kind and say I have matured and grown past the failings of my twenties and early thirties. But I haven’t really if I am still repeating the same bad habits. On November 1st, I started working on a young adult mystery novel that I was excited to write. I still intend to finish it. But it presented some complexities that I just didn’t feel I could handle in a month. That and one of the characters surprised me and not in a good way so after having written about 12,000 words, I abandoned it and sat idle for a week without a new plan. Where else have I done something similar in my life? Has there been a relationship that ended and I sat idle, not willing to move back, but not able to move on for far too long? Has there been a job that I left and sat idle for far too long, suffering in my idleness but unwilling to try again or try something else? How are my personal failings manifested in these little challenges I give myself? Can I fix the little cracks as a way to help fix the big picture? I intend to finish my NaNoWriMo challenge on time. I intend to write 50,000 words before midnight on November 30th. Right now that means averaging 5K everyday and I’ve been doing it. Yesterday, I wrote about 7,000 words in a day and today, I sat at a table in Starbucks for about 4 hours and wrote 5K without so much as a bathroom break. I count these as some of my more admirable qualities – the decision, the commitment, the ability to persevere. But the bigger picture isn’t about this or any other challenge. This problem is bigger than NaNoWriMo. This is about my attitude toward life and I intend to fix that too, move the decision, commitment and perseverance into being more consistent habits than just an attempt to get myself out of a sticky situation. I’d like to be consistently good at the things I’m good at. We’ll see how it goes. I am trying really hard. I look forward to being able to share the news when I’ve accomplished my goal. Great going. I know you will finish on time. You have it in you. You are a real inspiration, to me and others, I’m sure. Thanks Mom. You’re always cheering for me! I appreciate you.